Note: Writing patterns is REALLY not my thing, I tend to make it up as I go along but I have tried to write this down for you! Please, please do leave a comment if you feel corrections are in order! (I used dk for the big ring and 4 ply for smaller rings). Any of the pattern can be made up in stripes or whatever you fancy to suit! Round 1: Chain 18 and slip stitch into first chain to make a loop. Continue in a spiral (instead of discrete rows), stuffing as you go. until tube is approx 11” long. Insert 2 large bells and continue stuffing and crocheting until tube is 22” long. 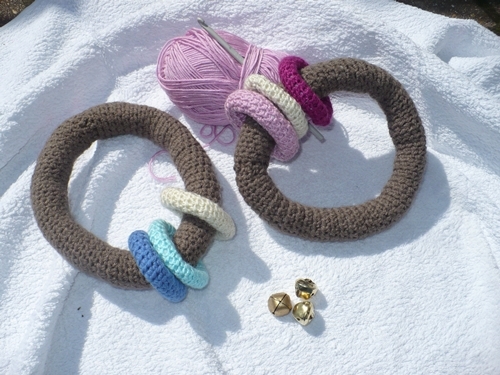 Bend tube into a circle and stitch (or crochet) the ends together. Note: The bells don’t ring inside the tube, more like rattle! If you are making this for someone else warn them the bells are there, I’m not sure how you’d manage to get them out but they could be a chocking hazard if they did come out! Round 1: Chain 8 and slip stitch into first chain to make a loop. Continue in a spiral (instead of discrete rows), stuffing as you go if required. Yarn over, through stitch, yarn over, through both loops. I *think* this is an American hdc! So cute, and love the color choices! Saw this in your archives and thought it was really cute! I love this and I know babies would have fun with it. My son has a plastic toy that’s almost exatly the same and it;s perfect for his little hands.